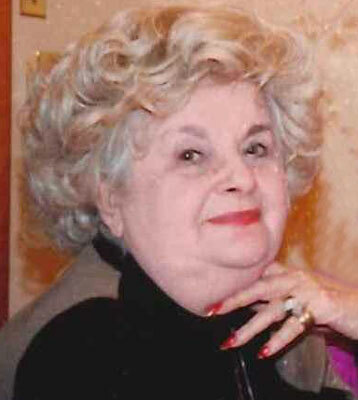 CANFIELD - Genevieve “Jean” C. Bair, 90, passed away Aug. 1, 2014, at Hospice House. Genevieve was born Oct. 20, 1923, in Youngstown, a daughter of the late John and Caroline Sobarnia Rudnicki. She graduated from Woodrow Wilson High School and attended Youngstown College and Delaware Community College. She was an employee of Ohio Bell Telephone and also General Electric for 17 years. After retiring, she did volunteer work at several organizations and also traveled with her husband covering the east coast states as counselor for Service Corporation International. Her husband, Floyd Bair, whom she married Aug. 19, 1946, passed away Oct. 16, 2012. She leaves her daughters, Sandra (James) Welch of Santa Ana, Calif., Jacqueline (Robert) Kendall of Madison Heights, Va., Diane Davidson of Canfield, and Sharon (Alan) Sipos of Brownsburg, Ind. ; her sons, Gregory (Connie) Bair of Hudson, Fla., Christopher Bair of Lakeridge, Va., and Brian Bair of Pennsylvania. She also leaves her grandchildren, Amy Tolin, Kara (Chad) Girton, Raquel (Brad) Scheetz, Jessica Bair, Stephanie (Ellis) Bair, Emilie Bair, Andrea Knauber, Ashley Jastrab, Robert Jastrab; three great-grandchildren, Samantha McElroy, Chase Girton, and Natasha Knauber; and four brothers, Thomas Rudnicki and Edmund Rudnicki both of Youngstown, Stan Rudnicki of Austintown, and Henry Rudnicki of California. Besides her parents and her husband, Genevieve was preceded in death by a brother, John R. Rudnicki; a son-in-law, Thomas Boucherle; and a daughter-in-law, Melissa Bair. The family would like to thank Dr. Francis Turocy for his extraordinary care, Dr. Mark Memo, the compassionate nurses at Hospice House, and St. Elizabeth Boardman Health Center. Funeral services will be at 11 a.m. on Tuesday at the Lane Family Funeral Homes, Canfield Chapel, 65 N. Broad St. Friends may call one hour prior to the service. The family requests in lieu of flowers, donations be made to Hospice of the Valley, 5190 Market St., Boardman, in Genevieve’s memory. Family and friends may visit www.lanefuneralhomes.com to view this obituary and send condolences. Please share your memories of Genevieve.